This page covers Latest News; Fundraising; About the Millennium Green and Management. The April, 2019 “100 Club” Prize Draw made on behalf of The Green was won by Bryan and Jackie Markham who received £45 with second prize of £20 going to Mrs Linda Jones. Congratulations to them all. If you would like to join this quarterly draw then please feel free to contact me on 01568 708982. On behalf of K.M.G.T. I would like to thank Keli Partridge who kindly donated the proceeds made from her refreshment stall at her recent Garage Sale to The Millennium Green. We are still looking for volunteers/stall holders etc for Angelfest 2019 to be held on the 17 August. If you can help in any way please contact either myself or Jackie Markham on 708281. Many thanks. 12.4.19 – a full list of the apple tree varieties on the green has now been updated and is in the ‘About Kingsland Millennium Green’ article further down the page. 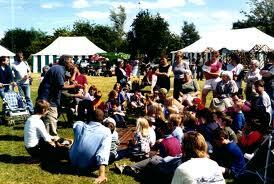 On the 18th August the weather stayed fine which was a bonus as “Angelfest” was held on Kingsland Millennium Green. The Music, Craft and Cider Festival certainly lived up to its billing with a variety of stalls lining the Green selling their goods. There was a variety of foods to be experienced throughout the day with The Angel Inn (who kindly sponsored the event) providing a bar. Six live bands generously kept the crowds entertained through the day with a variety of music to suit all tastes. Entry to the Green was free, however, a collection was made at the gate which resulted in the fantastic sum of £822.06 being raised which was divided between Midlands Air Ambulance and the Millennium Green to help with its upkeep. A big “shout out” must go to all those who helped on the day along with people who generously lent equipment etc to enable things to run smoothly. There are far too many people to thank here but they have all received letters acknowledging their participation. It was great to see so many local people in attendance and for The Green to be the “social hub” of the village for the day. For those of you who don’t know the Green was originally purchased by Kingsland residents to save it from being developed for housing and to provide an informal area for relaxation, recreation and a wildlife haven for the village centre. It is hoped that “Angelfest” will become an annual event with the 17th August, 2019 being pencilled in for next year! AngelFest 2018 – Skittles and Photo Quiz winners – plus the Photo Quiz Answers! Seniors: Richard Lodge with a score of 12. Juniors: Joint first Arron Ross and Cory Tebbs with scores of 8. 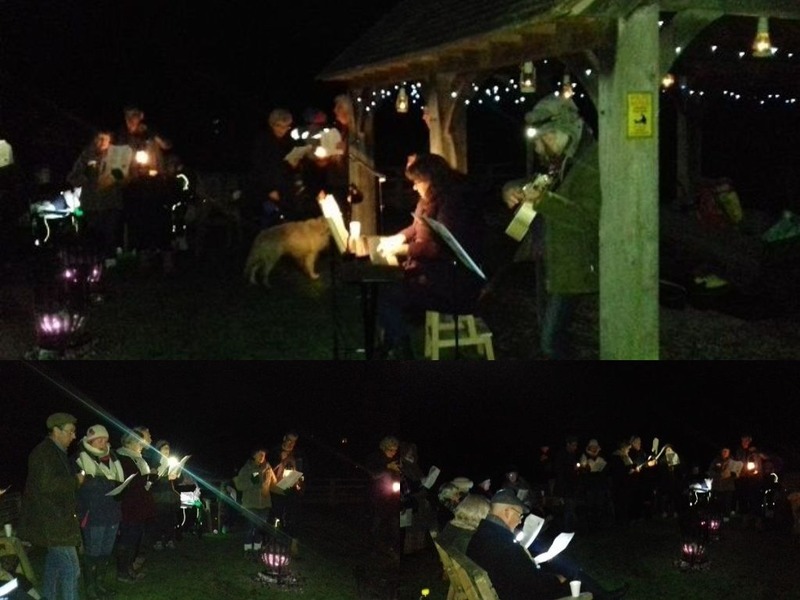 On Saturday 16 December, 2017 the annual ‘Carols on The Green’ event was held. This year were were joined by musicians Richard and Jane Lodge who accompanied The Reverend Julie Reid which made the evening even more enjoyable and musical. Mulled wine and mince pies were served and the largest turnout so far sang along to a selection of Carols and Christmas songs. The magnificent sum of £280.00 was raised via a collection which this year is being sent to the Supported Housing For Young People Project which works to support 16-25 year olds who are homeless or at risk of becoming homeless across Herefordshire. We would like to thank everyone who attended this fun evening and for your very generous donations. 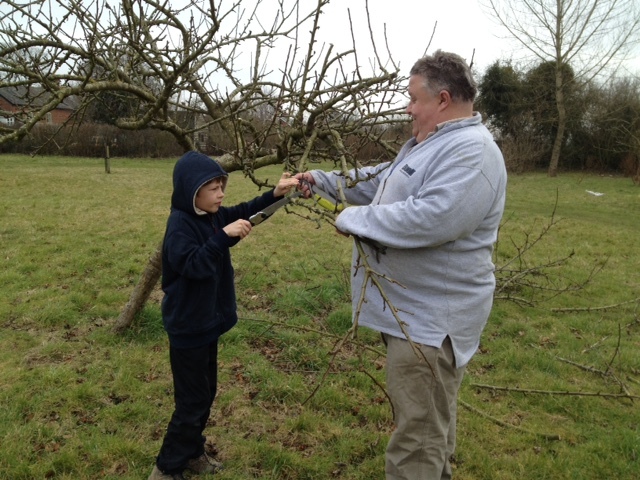 On Saturday 12th March 2016 twelve volunteers guided by James Bisset, Herefordshire’s expert in orchards and fruit tree pruning, tackled the apple trees on the Green and burnt the cuttings in the fire bay. It was a very productive morning and everything is now ready for the coming months. Last year we had a huge apple crop; I wonder what it will be this Autumn? The grass also had it’s first mowing two days later. 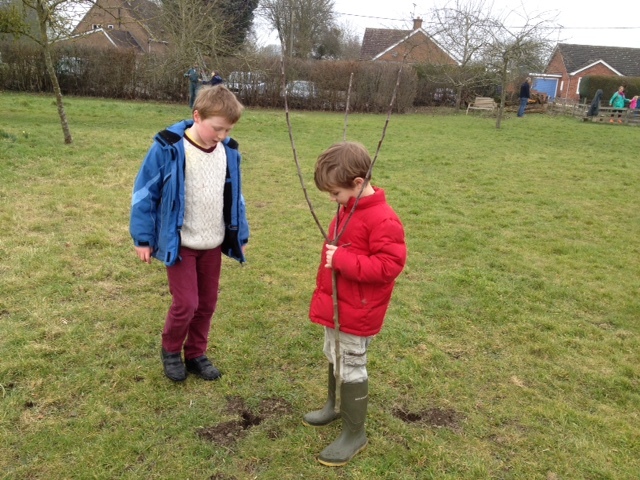 WARNNG: We noticed that rabbits have been extremely busy this Winter and have dug a huge number of small holes in the grass. We shall do our best to fill them in before the chief of rabbits visits the Green on Easter Sunday, but do be careful not to trip up if you are running or playing on the Green. Kingsland Millennium Green Trust (KMGT) is currently defined as an “unincorporated charity” and is run by twelve trustees. It is registered with the Charity Commission under number 1070085. As with all similar entities, the trustees of KMGT are responsible for making all of the decisions in respect of running the charity. Having said that, they certainly take in to account the views of all interested parties, many of whom attend the open meetings, before making their final decisions. There is currently a proposal to change the constitution of KMGT. From a practical perspective it will make no difference to the concept of the Green and its use and maintenance. The reason for the proposed change is to replace the original trust deed (dated 22nd May 1998) with a Charity Commission approved model, which has been tailored to the needs of the Green. This will bring it up to date in terms of existing charity law, which has changed several times since 1998, provide a better legal basis for the trustees going forward, and provide a better level of protection for existing and future trustees who are personally liable for all matters at present. The situation now is that the Charity Commission, along with Natural England and The Big Lottery Fund, are preparing a new model constitution which is suitable for all Millennium Greens. All three entities were party to the original trust deed in 1998 and therefore must be involved in the change. There is no clear timescale on when the new model will be available but the Trustees wish to place a proposal regarding the principle of the change of constitution on the agenda for the KMGT Annual General Meeting on 7th May at the Coronation Hall at 10 am. In accordance with the existing Trust Deed, decisions of this nature have to be done at the Annual General Meeting. In the event that it is formally decided to change the constitution then, when the new model is available, a new charity, with the same name as the current one, will be registered with the Charity Commission, new trustees will be appointed (although they can be the same as the current trustees), the land forming the Green transferred to the new entity, and the existing charity closed down. Again it should be emphasised that it will make no practical difference to the Green usage and maintenance. If you have any questions on this issue, please feel free to email the Honorary Secretary, Andrew Parsons, on parsons142@tinyworld.co.uk and he will liaise with the trustees in order to respond. 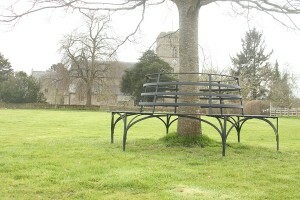 Jill Probyn’s bench has been installed round the oak tree near the pavilion. This elegant metal bench, beautifully made by Owen Mabbort of Shirlheath, has been paid for by funds raised at a coffee morning held in 2014 and a 106 grant. Jill was a driving force from the outset of the Millennium Green project and continued to be involved with its management, as well as giving her time generously to many other village groups and projects, until she died just a year ago. We are sure she would have appreciated sitting here with her friends and watching others enjoy the Green. If you would like to take part in our on going Quarterly Prize Draw please contact Sally Good on 0787 934 3933. The money raised from this lottery goes a long way towards paying for the upkeep of the Millennium Green and new participants are always welcome. 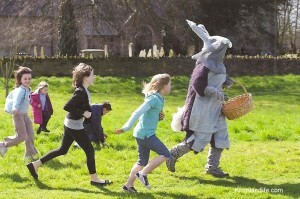 The Easter Rabbit distributes chocolate eggs on the Green after morning service, at approximately 12.15 p.m. on every Easter Sunday. To pay for his eggs we run a Grand National Sweepstake. If you would like to help by selling tickets please get in touch. We would be really grateful. The committee is always interested to hear of possible use of the green for non-commercial rental use. 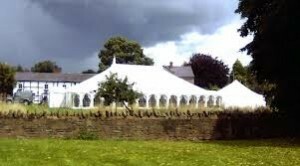 (eg a Marquee was put on the Green for a wedding reception). Please see hiring conditions here or contact Jackie Markham on 01568 708281. Please note: At the KMGT Management meeting in January 2011, it was decided that, for safety reasons, NO fireworks would be allowed on the Green at any time. Kingsland Millennium Green is a 1.4 acre site located in the centre of Kingsland, near Leominster, Herefordshire and is the typical green serving the village and anyone passing by who wants to stop, reflect on life’s rich patterns or just admire the view. 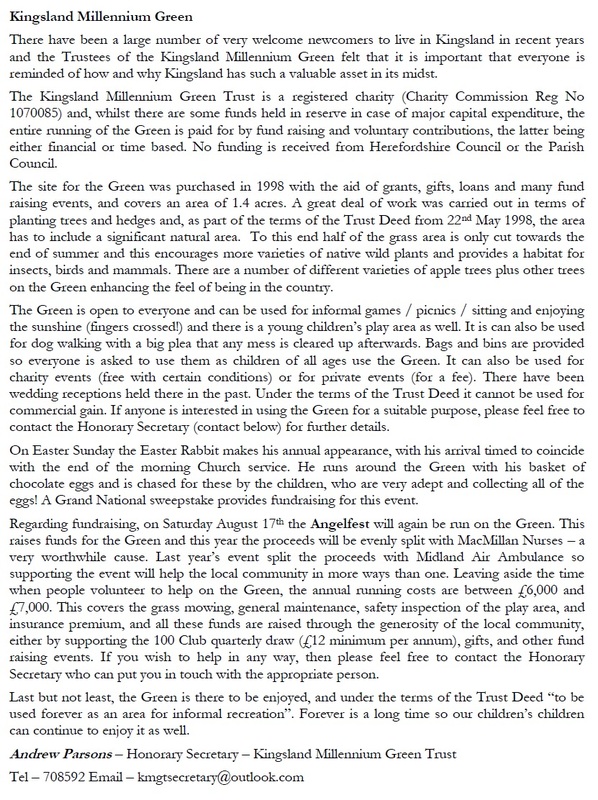 The field that is now the Millennium Green was bought by the community in 1998 with the aid of grants, gifts, loans and a great many and varied fund-raising events. 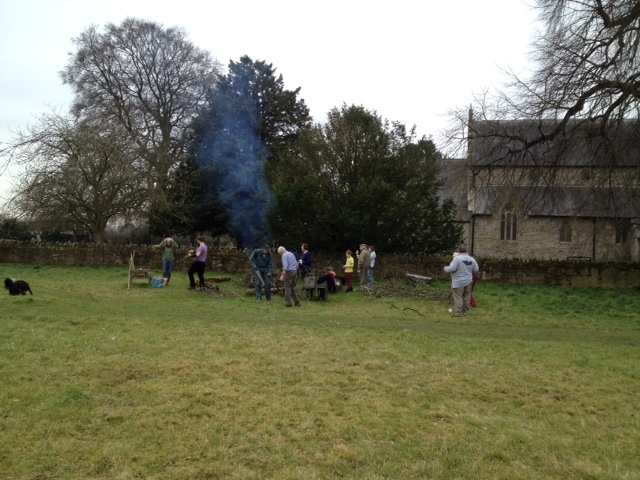 Hedges were renewed with native plants; three specimen hard wood trees were planted along with traditional apple and nut trees and several hundred wild flower plugs. The redundant buildings were replaced with a children’s play area and an oak open-sided pavilion. A small piece of ground nearest the Church was hedged off and surfaced for car parking. Twelve trustees (see table below) are responsible for the care of the Green. Half the grass is cut regularly throughout the summer, the remaining meadow grass is cut in the late summer and the crop is removed which has the effect of impoverishing the ground and encouraging more varieties of native wild plants and grasses to establish themselves every year, and providing a suitable habitat for insects, birds and mammals. See under Flora & Fauna (left hand side menu) for details of General Plants and Grasses which can be found on the Green. Funds are raised regularly for our maintenance costs and insurance via a quarterly lottery, sponsorships, many regular donations and intermittent fund raising events (left hand side menu). Every Easter Sunday the Easter Rabbit makes his appearance on the Green. He tries to time his arrival to coincide with the end of morning service. Laden with baskets of chocolate eggs he is chased for these by the children, you have to be quick! A Grand National sweepstake is run by the trustees to raise money for purchasing the Rabbit’s eggs – see under Fundraising. The Green can be used for informal games, picnics etc every day of the year. Dogs are welcome, but please clean up after them. This is extremely important as the green is used by children of all ages. If you bring a picnic do please take away your rubbish. Please do not leave glass, tins or other litter. The Green can be booked by other village charities for events at no cost but with certain conditions and by private individuals for an agreed fee; recently it was the venue for a wedding reception, the church fete, and carols by lantern light. It cannot be used for commercial gain. For details please apply to the Secretary or see the link to the Hiring Conditions under Fundraising above. 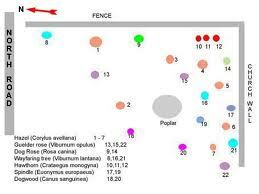 A tithe map shows an orchard on the land, and old photographs show fruit trees, now long gone. Standard, widely spaced, apple trees have been planted on a ‘derelict broken grid’ to eventually give the appearance of an ancient orchard, and the area extends to a meadow that runs along side the mown open area. Most recently a copse of woodland trees has been planted in the southern most corner. Many common wild flowers have been recorded including Celandine, Ox-eye or Moon Daisy, Hawkweed, St John’s Wort, Travellers Joy, Yarrow, Hedge Mustard, Scarlet Pimpernel, Violet, Burdock, Medick, Clover, Herb Bennet, Herb Robert, White Briony, Stitch Wort and in the last two seasons an Orchid. Primroses, Narcissus, English Blue Bells and Cowslips were introduced as plugs. Details of all the tress, flora and fauna including complete listings can be found in Millennium Green – Extra Information. If you spot anything else that should be added to these lists please let the committee know!